Many people lose some or all of their teeth. Dentures, whether full or partial, are a removable solution for the replacement of missing teeth, be that multiple teeth or a full set. This is the treatment of choice if there are insufficient teeth to support a bridge. Several impressions of the mouth are taken using various types of putty, which are then cast into a mould which is used by a laboratory to manufacture your denture. There are many different types of teeth to choose from in different sizes and shades, and we also pay attention to the appearance of the artificial gum. You will be guided through the process and given the opportunity to assist in the choice of teeth and therefore the resulting appearance. Dental implants are becoming the alternative option to dentures, but if dentures are the only solution then there is no need to have teeth that look false. 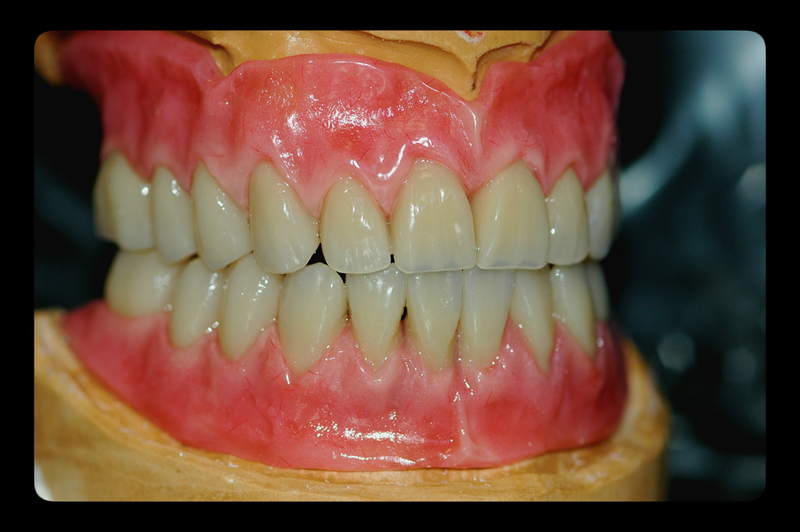 With careful planning and thought, even full dentures can be made to look natural. A denture is a removable substitute for missing or lost teeth made from acrylic (plastic) or metal. The denture can replace any number of teeth, from single teeth to all the teeth in either or both jaws. A denture replacing all the teeth in either the upper or lower jaw is called a complete or full denture, and is usually made from acrylic. A denture which replaces only some of the teeth in a jaw is called a partial denture and uses metal clasps or clips to limit the movement of the denture during eating. Why do people wear dentures? Complete or full dentures replace all the teeth in either the upper, lower jaw or sometimes both jaws. With no teeth in one or both jaws, people find eating and speaking clearly more difficult. A complete denture gives both lip and cheek support – without this, a person may look older and have low confidence and self-esteem. Partial dentures are often worn for the same reasons as complete dentures but are advantageous in other ways. When people lose teeth, the teeth next to the space left behind may move, as can the teeth in the opposing jaw over said space. A partial denture can prevent this unwanted tooth movement. How many appointments will it take to make a denture? A denture will often take between 5 and 7 appointments. Each appointment would be around 30 minutes long, and approximately 1 week apart. When do I take the denture out? Your dentist will advise you to remove your denture at night before going to bed, to allow your gums to rest and to keep your mouth healthy. How often should I get a new denture? The gums and bone after tooth removal shrink. This happens at a fast rate initially, and then although this slows, the process is continuous. If the dentures become loose, the denture will need to be relined (a new fitting surface added to the denture) or remade. A denture can last 7-10 years without the need for relining or replacement. An immediate denture is a denture that is fitted straight after the tooth or multiple teeth are removed. This means that you don’t have to go without teeth. These are often needed when all the teeth in a jaw are being removed, or when a tooth or teeth are being removed from the front of your mouth where missing teeth would be noticeable. The dentist takes moulds of your mouth 1-2 weeks before the teeth are removed. A dental technician then makes the denture, and then as soon as the teeth are removed the denture is fitted. Your dentist will often ask you to keep the immediate denture in place for the first 24 hours after which the denture is taken out at night-times. As the normal healing process after tooth removal causes a shrinkage in the bone and gums, the immediate denture will usually require remaking 6-9 months after the tooth removal. Moving dentures can cause pain to gums, limit food selection and reduce people’s self-confidence. Dental Implants can be used with partial and complete dentures. The implants have attachments fitted to them that the denture clips to and reduces its movement, improving people’s quality of life. Crowns are used to restore both anterior and posterior teeth that have been broken or are at high risk of breaking due to oversized fillings or fractures. There are a variety of materials available to construct these, such as gold, porcelain bonded to metal, or all ceramic. 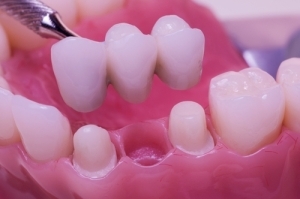 Bridges are fixed or non-removable prosthesis constructed to replace one or more missing teeth. Either one or both teeth adjacent to the space are used to anchor the bridge to restore function as well as appearance. 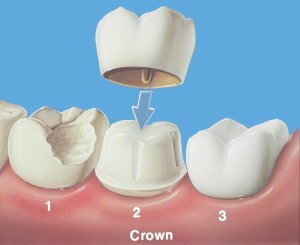 Like crowns, bridges can be made of porcelain bonded to metal or all ceramic. Because there is interference with the adjacent teeth, more and more people are opting for dental implants as an alternative to sacrificing sometimes healthy teeth.